Parents of a group of girls between the ages of six and twelve wanted someone to help their daughters memorize some Quran. The girls’ ability to do so varied but their lack of interest was similar and the most striking thing they all had in common was their inability to settle and focus for a reasonable amount of time. This was solved by breaking up the period of time to seven parts, and naming the girls the “Rainbows”. Once, many years ago, this name had been given to a group of young girls to give them a sense identity and a feeling of belonging; for this group it mainly helped maintain their interest by breaking every session into seven parts. They made masbahas out of beads the color of the rainbow and we started with a dhikr session (again seven) very short and easy remembrance phrases for them to repeat seven times each. Next, they memorized Quran, then they listened to a short talk. The talk always began about rainbows and incorporated a hadith or something special about Quran (in both cases it could be something related to what they were memorizing), at times it answered a question they may have asked. Next, we talked about the prophets, then about Prophet Muhammad (pbuh), then they did some activity. 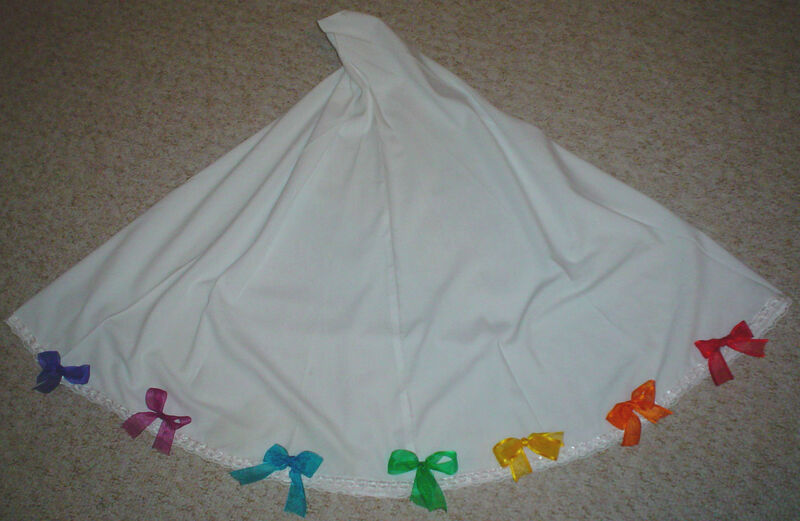 One activity was to make prayer clothes with bows all around the skirt hem and headcover hem the colors of the rainbow. Time flew! And they enjoyed it and began to look forward to it, too. We made booklets to remind them of what we did together, and as a souvenir, since all of them were just visiting for the summer. Each section had the information discussed here pasted on construction paper of a color of the rainbow. So the first chapter was about the tasbeeh and was pasted on red. The next chapter was about Quran and was pasted on orange, and so on. See samples below. Below are samples of the pages we made. Click to view them. They correspond to the portion below describing the parts of each session. Each page is framed in a box, we cut the box out and pasted onto a paper that was one of our rainbow colors. The colors of pages are in this order: red, orange, yellow, green, blue indigo, violet. The session break-up corresponds to the pages of their book, shown above. Each is repeated seven times. It helps to have them written in transliteration before they know them by heart, as in our example. Depending on your time, you can explain one of them each session and tell them what makes it important, see our sample page. If Arabic is difficult for them, you could have them memorize the same ‘longish’ sura and do it chorally. If they have been memorizing and each is at a different place, then encourage them to bring whatever they use to memorize from (iPod, etc…) with them, or invest in a few yourself so they can individually listen and memorize, before they recite to you. Obviously if the number exceeds five you need someone to help you listen to their recitation. If they are new (and young) then little incentive cards that have five suras on each for them to accomplish at a time may help maintain their interest and give them the needed drive. Click here to see sample incentive cards. Depending on the group and the mood, you can either have a guess-the-answer-session for Quran or explain a certain sura (perhaps the one they are all doing), or choose a subject to talk about using all the evidence from Quran. I find the general information game about Quran to be important and fun. With their Mushafs in their hands, you can ask them, how many surahs are in the Quran, which sura is first, last, longest, shortest…there will always be those who know or who can find the answer. The rest are learning without realizing and will answer these questions in the future as the answers are repeated in front of them. Most children have heard the stories of all the prophets. On the one hand to tell the story of each prophet may bore them, but on the other hand, you know the stories are neither clear nor complete in their heads. Again, a guessing competition type of game will help fill in the gaps, make connections and get them curious. See our sample page. Later, you could ask each child to draw a name and prepare to tell us next time about a prophet. Much later you may want to do a Prophets Book and have them help write about each. Mostly what is needed here is for them to begin to love the Messenger (s). Stories about his kindness, gentleness, playfulness, bravery etc…are important here. 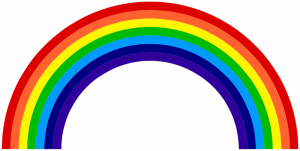 First you should have a song about the group specifically, one is included for the Rainbows. Next, you should have songs about the Prophet(s), about Quran and about being a Muslim in these times. One activity was to make prayer clothes with bows all around the skirt hem and scarf hem the colors of the rainbow. See a sample here. Trips should also have a purpose. In order to get the children excited and interested, go on the trip without them, first. Make a note of all you want them to notice, then make a list, or a treasure hunt style clue game. It will be more enjoyable for them to search for and find the items from a pre-prepared list.